Morning, Jo. Thanks very much for having me. I suppose it’s true to say that I’m a middle-aged wife and mum. Although, as anyone of my age will tell you, we never really feel like we’ve reached that note-worthy point of middle age! I live on the beautiful Isle of Wight, a move we made as a family six years ago. I have two teenage sons and a 2-year-old standard poodle, called Forrest (named after Mr Gump.) I came to writing quite late in life, but I’m so glad I finally found it, or it found me! Originally, I thought I fancied writing for children. However, I soon discovered that my characters’ choice of vocabulary and my subject matter were far from conducive with kid’s books. I dabbled in short stories when I was younger, but I’d say my writing journey began properly when I attended some Creative Writing courses which were being held locally by the author, Sophie King. I found that I thoroughly enjoyed those two hours a week and soon developed a love of writing. At one of the classes, I wrote a piece of flash fiction about a guardian angel who had been allocated Sue Shepherd to watch over. It was a comedy piece about how disastrous I was, and how all the angels dreaded getting assigned to me. I don’t know why, but I decided to give the angel a human side and described her staff room etc. The group seemed to like the piece, and Sophie suggested I elaborate on the idea. Before I knew it, I was writing a full-blown novel, and very quickly my three main human characters made themselves and their situations known to me. From those humble beginnings, my best-selling novel ‘Doesn’t Everyone Have a Secret?’ was born. I’m very nosey. I listen in to people’s conversations and I think, ‘Oh, that’s going in a book.’ Obviously, not word for word! The general situations that people find themselves in fascinate me. I never do a lot of plotting for my books. I prefer to put my characters in a situation and see where they go. My second novel, ‘Love Them and Leave Them.’ is about a split-second decision. It begins with a man driving and he must decide whether to hit a rabbit in the road or swerve. The story then shows his twenty-something daughter six years later, living two very different lives. That story was inspired by a piece I read about a woman who had a car accident when she swerved to avoid a bird in the road and collided with a telegraph pole. Sadly, her life was dramatically changed from that day forward and, as well as feeling terrible for the woman and her family, my main thought was, ‘Gosh, I’ll bet she’d give anything to go back and make that decision again.’ And that’s how my second novel began. I’d say Western Australia, because I went travelling for a year around Australia when I was 24, but I never made it over to the Western side and everyone told me it was “The best bit!”. However, I’m not convinced I could do such a long flight now I’m a … um … middle aged woman! So maybe, I’ll say Iceland, because I’d love to see the Northern Lights. Have you another book in the pipeline? If so, can you tell us something about it? I’m on the second draft of my 3rd book. My publisher is also my editor and I’ll soon be sending it to him for his thoughts. Obviously, this is now the third time we’ve done this process and one of the things I love most about it is how invested into the books Ian becomes. By the time we’re on the final, final edits we both know the characters so well, it’s like we’re discussing mutual friends. I can’t tell you what the third book is about, sorry. But I can say, it’s very much in my usual style, hopefully funny in places, but also moving. I like to have something slightly different in my books, for example, angels and parallel lives, and there is a similar element to book three. Mysterious, huh? I enjoy tackling bold subjects, and, thankfully, I’ve been assured I handled them with sensitivity. I’m a big fan of Marian Keyes. I think it was reading her novels that really helped me to decide on my preferred genre. Along with Sophie King, Marian showed me that it’s possible to write a novel from multiple viewpoints, which I really enjoy. Another thing I love about her books is how she can go from laughter to tears in the space of a page. She has a wonderful warm Irish voice which is captured within her books. However, I think we all need to find our own writing voice and stick to it, so I won’t be attempting any Irish charm of my own. My writing voice has been described as containing a dry wit, and I’m more than happy with that compliment. One day, I’d love to meet Marian and thank her for being such a great influence. I must say that she does follow me back on Twitter, a fact I’m very proud of. And lastly, a Desert Island Disc themed question. If you were planning to spend time away from civilization, what four songs would you take with you and why? I’m so pleased you asked this question. I recently got interested in desert island discs. My sister told me Marian Keyes was on and I had a listen to her and found her life story very moving. After that, I was totally hooked, and I’ve been listening to loads of back episodes and thinking about what discs I’d choose, so this is a brilliant question to finish on. 1. Do you love me by The Contours. It’s part of the ‘I carried a watermelon’ scene in Dirty Dancing. Oh blimey, when Johnny Castle bursts through that door! The song is just so vibrant and energetic. I heard it in the supermarket recently, it was difficult to stop myself from dropping the basket and dancing! 2. Kiss Me by Sixpence None the Richer. It reminds me of when my husband and I first met. It was kind of our song. It’s romantic without being vomit inducing. 3. Shut up and Dance by Walk the Moon. It’s got a kind of 80s beat and much like my first choice, I find it energising. My teenage sons even allowed me to play it on repeat in the car for a little while. Sue Shepherd writes contemporary romance and enjoys creating novels with heart, laughs and naughtiness. She doesn’t pull any punches when choosing her subjects, but manages to handle her characters’ challenging situations with sensitivity and humour. Her debut novel ‘Doesn’t Everyone Have a Secret?’ was published by Corazon Books in March 2015. It reached the top 10 UK Kindle chart, and also topped the romantic comedy, contemporary romance and humour charts. It became available in paperback on Amazon.UK in November 2015. 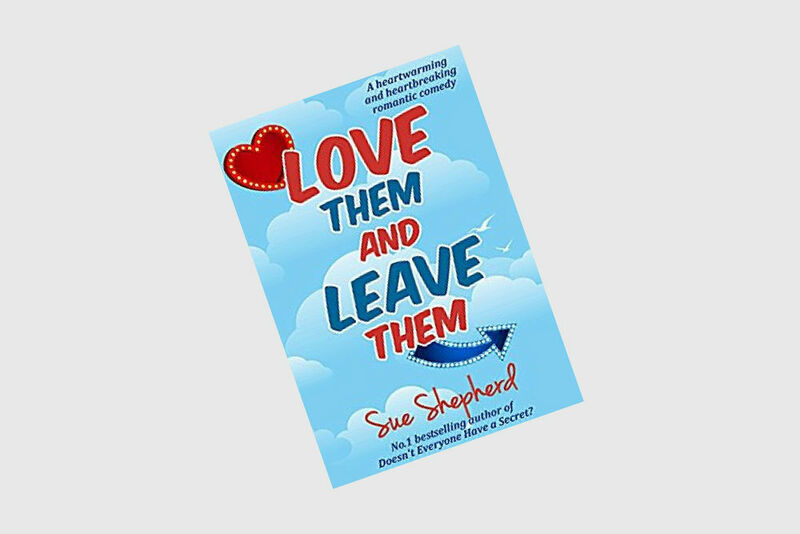 Sue’s second novel ‘Love Them and Leave Them’ was published in September 2016.